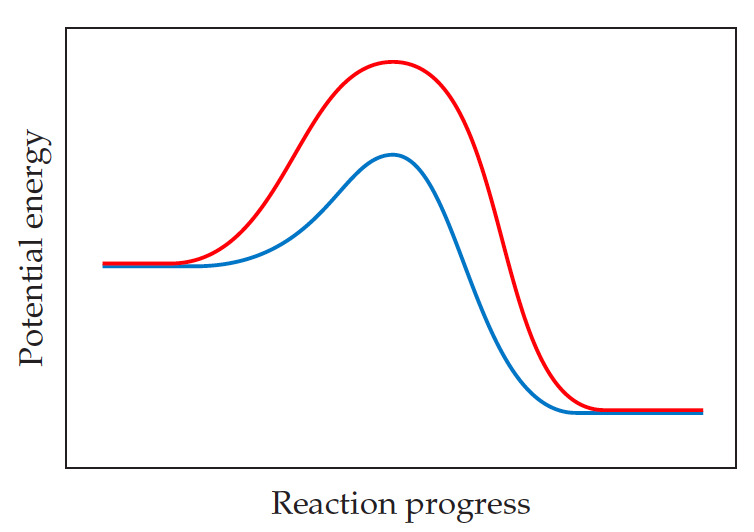 Solution: The following graph shows two different reaction pathways for the same overall reaction at the same temperature.Is each of the following statements true or false? (a) The rate is faster for the red path than for the blue path. (b) For both paths, the rate of the reverse reaction is slower than the rate of the forward reaction. (c) The energy change ΔE is the same for both paths. The following graph shows two different reaction pathways for the same overall reaction at the same temperature. Is each of the following statements true or false? (a) The rate is faster for the red path than for the blue path. (b) For both paths, the rate of the reverse reaction is slower than the rate of the forward reaction. (c) The energy change ΔE is the same for both paths.